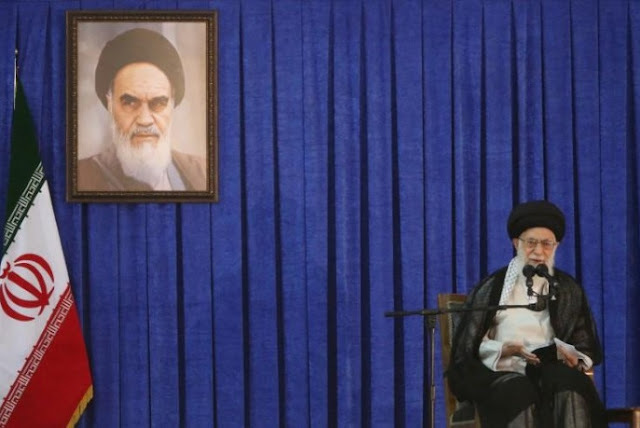 Iran's Supreme Leader Ayatollah Ali Khamenei delivers a speech during a ceremony marking the death anniversary of the founder of the Islamic Republic Ayatollah Ruhollah Khomeini, in Tehran, Iran, June 4, 2017. UNITED NATIONS - The 2015 nuclear deal between Iran and world powers faces a stern test at the United Nations this week as Europeans try to persuade a skeptical Trump administration to keep it, while Israel lobbies to turn up the pressure on its regional rival. U.S. President Donald Trump, who must make a decision by mid-October that could undermine the agreement, repeated on Thursday his long-held view that Iran was violating “the spirit” of the deal under which Tehran got sanctions relief in return for curbing its nuclear program. The prospect of Washington reneging on the agreement has worried some of the key U.S. allies that helped negotiate it, especially as the world grapples with another nuclear crisis, North Korea’s nuclear and ballistic missile development. “We all share U.S. concerns about Iran’s destabilizing role in the region, but by mixing everything up, we risk losing everything,” said a senior European diplomat, who was part of the 18-month negotiation process that led to the accord. Iran’s Supreme Leader Ayatollah Ali Khamenei warned on Sunday that Tehran would react strongly to any “wrong move” by Washington on the nuclear deal. At the U.N. General Assembly on Monday, Trump meets Israeli Prime Minister Benjamin Netanyahu followed by French President Emmanuel Macron, who like Trump, is making his inaugural appearance at the annual gathering of world leaders. Both have very different messages to deliver. “Our position is straightforward. This is a bad deal. Either fix it — or cancel it. This is Israel’s position,” Netanyahu said in Argentina last Tuesday as he toured Latin America. Israeli officials said he would also relay concerns over what Israel describes as Tehran’s growing military entrenchment in Syria and its post-civil war role in that country. They said changes that Israel was seeking in JCPOA included lengthening the 10-year freeze on Iran’s nuclear development program or even making that suspension permanent and destroying centrifuges rather than temporarily halting their operation. The deal was brokered by the United States, Russia, China, Britain, Germany and France. The six will meet with Iran at the ministerial level on Wednesday. Paris took one of the hardest lines against Tehran in the negotiations, but has been quick to restore trade ties and Macron has said repeatedly there is no alternative to the deal. French officials say Iran is respecting the JCPOA and that were the International Atomic Energy Agency (IAEA), which ensures its implementation, to say otherwise, a mechanism exists to reimpose sanctions. Macron, who won praise from Trump while hosting him in July at France’s Bastille Day celebrations, will warn him that weakening or scrapping the deal would not only add fuel to a regional powder keg but deter North Korea from negotiating on its nuclear program, French diplomats said. It would also signal the beginning of the end of the Non-Proliferation Treaty, which entered into force in 1970 and is aimed at preventing the spread of nuclear weapons and weapons technology, they said. “We can always find legal arrangements to make it look like the deal is still in place, but if the U.S. no longer supports it politically, then the reality is that it will be in serious jeopardy and its implementation will be very difficult,” said a senior French diplomat. U.S. Secretary of State Rex Tillerson argued on Sept. 15 that Washington must consider the full threat it says Iran poses to the Middle East when formulating its new policy toward Tehran. The French diplomat underlined that the nuclear deal was achieved in large part because it was not linked to all the other grievances the United States may have had with Iran. Macron will meet Iranian President Hassan Rouhani immediately after Trump to tell him that Tehran must play its role in not stoking American anger through its activities in Syria, Lebanon and Yemen, a French presidential source said. With Europeans not on the same page as the Trump administration, Iranian officials say they have an opportunity to divide the P5+1 grouping that negotiated the deal with Iran. A senior Iranian diplomat and a former nuclear negotiator said he believed the European members of the group had no intention in following Trump’s overtly aggressive Iran policy. “They are wise. Look at the region. Crisis everywhere. From Iraq to Lebanon. Iran is a reliable regional partner for Europe, not only a trade partner but a political one as well,” he said. “European powers have been committed to the deal. The IAEA has repeatedly confirmed Iran’s commitment to the deal. Trump’s insistence on his hostile policy towards Iran will further deepen the gap among the P5+1 countries,” the diplomat said.